University of Arkansas for Medical Sciences (UAMS)/Central Arkansas Veterans Healthcare System (CAVHS) researcher Sue Griffin, PhD, has gained international recognition for a significant breakthrough in the early events and potential for strategies toward overcoming and preventing Alzheimer's disease. Griffin is a pioneer in researching the role of neuroinflammation in the genesis and progression of Alzheimer's. Griffin's research specifically focuses on the way neurons respond to stress to promote neuron survival in situations that are acute, that is, stresses that are of limited intensity and duration. "In short, limited neuronal stress leads to activation of the brain's immune cells, glia, for the production and release of cytokines that, in turn, prompt the neurons to make proteins necessary for membrane and structural integrity," Griffin said. "One of these proteins that is produced in response to glial cell release of the immune cytokine interleukin-1 (IL-1) is the beta amyloid precursor protein, which is an integral membrane protein that is necessary for membrane repair. Another neuronal protein that is produced in response to production and release of IL-1 is a small protein called P-tau that is necessary to maintain the neuron's internal structure. "All is well when a stress is limited so that neuronal repair and normal order is restored. Problems begin when the neuronal stress is prolonged, for example, years of an unhealthy life style with overeating and insufficient exercise. In this situation, we must consider the effect of long term neuronal stress, prolonged glial responses with prolonged overproduction and release of cytokines like IL-1 that are inflammatory - perhaps necessary in the body to fight pathogens but not good in the brain over any extended period. Why is that? Because the overproduction of the beta amyloid precursor protein over a prolonged period results in the laying down of the beta amyloid plaques that are abundant in the brain of Alzheimer patients, getting in the way of the normal flow of information from one neuron as it speaks to another, and generally take up a lot of brain space." Griffin said that, unfortunately, the prolonged production of the other protein, which IL-1 induces, P-tau, results in formation of tangles of P-tau inside the neuron another feature of Alzheimer's. Griffin's Cytokine Cycle© conceptualizes how neuronal stresses such as head trauma, genetics, an unhealthy life style, and/or aging induce excesses in cytokines, creating positive feedback cycles that culminate in the appearance of tangled proteins inside the brain's nerve cells and the plaques outside the nerve cells that we see in Alzheimer patient brains. Griffin is the Alexa and William T. Dillard Professor and Vice Chairman for Research at the Donald W. Reynolds Institute on Aging and Department of Geriatrics at UAMS and Research Scientist at the GRECC/CAVHS. Griffin works with a large team of investigators under the aegis of an NIH/NIA-sponsored program at UAMS, and collaborates with scientists elsewhere in the world, all focused on finding a preventive that might delay onset and, in that way, "prevent" or "cure" Alzheimer's. Because of the current crisis of obesity and type 2 diabetes, which are now recognized as potential risk factors for development of Alzheimer's, she feels it is urgent to communicate to physicians and other healthcare providers the importance of talking to patients about prevention. 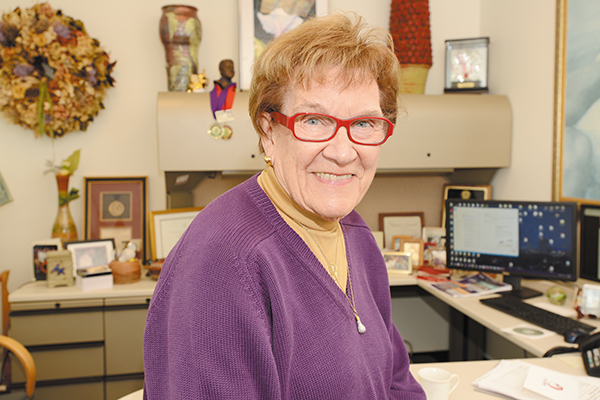 "The need to keep neuroinflammation at bay by lifestyle changes is of paramount importance," said Griffin, who recently received a $10 million grant from the National Institute of Health for her team's Alzheimer's disease research. "The most important thing you can do is to practice preventive strategies, which in plain English means living a healthier lifestyle." This is the message Griffin would like to encourage doctors to promote: "It is so apparent, especially here in Arkansas, what we must do; that is, we must begin to adopt and practice healthier lifestyles not just for Alzheimer's, but, importantly toward preventing a variety of diseases that often occur years before Alzheimer's is likely. All are intimately linked. You can't talk about what is good for the brain without talking about what's good for the heart - and really, the whole body." Studies, including those done in Arkansas, show that doctors can have a huge impact by talking with patients about lifestyle improvements. "I hope the doctors' message for parents is that we need to make sure that our children are living a healthful lifestyle as long as we have them," Griffin said. "Parents should teach by example. We have a big problem right here in Arkansas with high rates of obesity in children, which goes hand-in-hand with type 2 diabetes. Both of those conditions should be avoided and more likely could be by eating right and getting enough exercise. That may be hard because normally both parents work in order to provide for their children, and these days children and adults seem to be drawn to other more self-absorbed activities that just don't go with a lot of talking and training in food and exercise habits. Eating and playing together, sans electronics, would be a great start." Griffin would like to see more frank discussions especially between doctors and their patients on how to stay healthy. She points out how rapidly things have changed. Type 2 diabetes used to be called 'old age diabetes' because it didn't happen to children and young people." What the doctor says really matters, meaning that taking even just one minute to suggest changing from the high carbohydrate diets of many children to more well-balanced meals, Griffin said. It is hard to describe to a five-year-old, or even some thirty-year-olds, what a carbohydrate is. But Griffin says even young children can benefit by education about The Nutrition Facts that are on most everything we buy like how much a teaspoon of sugar weighs (four grams) and how many grams of sugar are in a regular size can of soda pop (39 grams). Super-sized drinks can easily be two or three times that amount. "The important message is that there are things people reading this article can do to help children lower their risk of having Alzheimer's in old age, but more importantly having mid-life horrors like type 2 diabetes, heart disease, and liver and pancreatic cancers that are associated with obesity and its consequences," Griffin said. "The public deserves and needs to know this. Let them know there are really good reasons to be watching what they are doing with regard to their weight, diet, and exercise. Do it for our children so then we may have a cascade effect through the coming generations." Rates of type 2 diabetes have doubled in the past 20 years, with Arkansas having the fourth highest rate in the country at 15.5 percent. "We are confronting all kinds of changes in our society," she said. "We are all learning about bump-stocks that turn guns into almost tommy guns. So why can't we see this thing about obesity? Why is that taboo? It really is imperative to face up to our health problems in the U.S. Importantly, studies of patients with Alzheimer's, suggest that exercise, maybe especially when practiced in groups, seems to be beneficial."